With summer here, I’ve been able to dig into some of the books I’ve got stacked up, waiting to be read. A few days ago I finished Malcolm J. Rohrbough’s Trans-Appalachian Frontier: People, Societies, and Institutions, 1775-1850, which I bought a couple of years ago. One of the prominent themes in this book is the role of government in the organization, settlement, and development of the eighteenth- and early nineteenth-century frontiers. The federal government secured lands to be settled by winning wars or negotiating treaties with foreign powers and Indian tribes. It established the ordinances to survey this land, sell it to private citizens, set up territorial governments, and transform the territories into states. It defended the frontier’s inhabitants from external threats. It contributed to the development of trade and communication routes, and obtained commercial outlets for the settlers’ commercial goods (i.e., securing the right to navigation of the Mississippi and use of the port of New Orleans). Also notable is the eagerness with which many frontiersmen formed their own government institutions, and the things they allowed those institutions to control. Many frontier communities established local courts with power to set prices and regulate moral behavior. If you lived in some eighteenth-century settlements, you could find yourself hauled before a magistrate for cursing or sleeping with somebody who wasn’t your spouse. This is interesting, because it runs against the notion a lot of people have of the early frontier. It was supposed to be a place where you could get away from authority. The men and women who settled the early West were supposedly hardy, independent-minded souls who wanted nothing from anyone, only land where they could carve a living out of the wilderness with their own two hands, free from the oversight of the settled societies back east. They were like characters out of an Ayn Rand novel, except they were dirt poor and carried long rifles. Well, sort of. Various sorts of people went to the early frontier for different reasons, so we make blanket generalizations about them at our peril, but it’s safe to say that many of them were more comfortable with institutions of authority than we often assume. When the settlers near the Watauga River in northeastern Tennessee found themselves outside the reach of effective government in 1772, they didn’t sit back to enjoy a state of blissful anarchy; they set up a five-man court with laws patterned after those of Virginia. In 1776, they petitioned the governments of Virginia and North Carolina to annex them. My point here isn’t to write an apologia for interventionist government based on historical precedent. One can find many instances in which early frontiersmen actively resisted government agencies. Frontier people weren’t really eager to welcome government just for its own sake. When they established courts, passed laws, and obeyed the laws of territorial governors, it was generally because there was something in it for them. What most settlers ultimately wanted, I think, was land and livelihood, so when a government institution could help them secure these things, they let it happen. The Wataugans wanted to farm their land unmolested by renegades and riff-raff, and their provisional government of 1772 was the best means to accomplish it. Similarly, other frontiersmen could tolerate or even support territorial governors who wielded almost dictatorial power under federal ordinances because it meant law and order and secure land titles. In other cases, frontiersmen acted against government authority when it interfered with their desire for land and livelihood. Federal authorities often had their hands full trying to keep settlers from encroaching on land reserved to Indian tribes by official treaties. The Franklinites weren’t shy about negotiating their own treaties and waging their own wars with the Cherokee in spite of the fact that their actions had no legal standing as far as the governments of either North Carolina or the United States were concerned. And, of course, the reason the Wataugans had to establish their provisional government in the first place is because they had settled across the mountains in direct violation of British authority. In these instances, law and government stood in the way of land acquisition rather than ensuring secure enjoyment of it, and thus frontier inhabitants cut through the red tape by acting on their own. I therefore submit that it’s a drastic oversimplification to say that inhabitants of the early frontier wanted independence and freedom above all else, if by “independence and freedom” we mean liberty from any government authority whatsoever. They were out to build lives for themselves where land and opportunity could be had, either with the aid of law and order or in defiance of it. The nature of their love-hate relationship with government depended on what it could do for them at any given time. None of this should surprise us, except that the archetype of the autonomous frontiersman casts such a long shadow over American history. After all, by welcoming government as long as it helped them secure their lives, liberties, and property and resisting it when it hindered them from doing so, these settlers were basically acting out the same relationship between Americans and government that’s been going on for over two hundred years. I’ve been on a real Tennessee frontier kick lately, visiting places in my home state that I’ve been meaning to see for a long time. A few days ago my cousin and I took another day trip to the Tri-Cities region, which means it’s time for yet another historic site review. 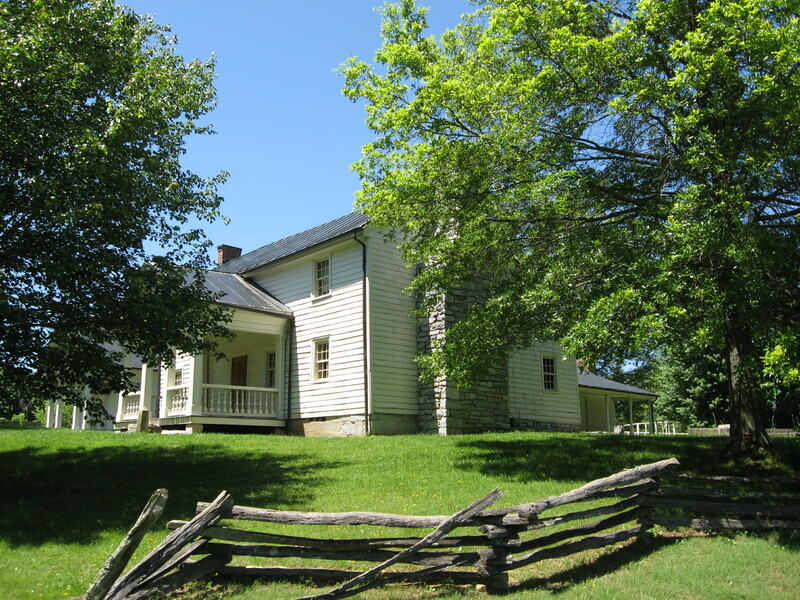 Tipton-Haynes State Historic Site in Johnson City has a story that goes back quite a long way. 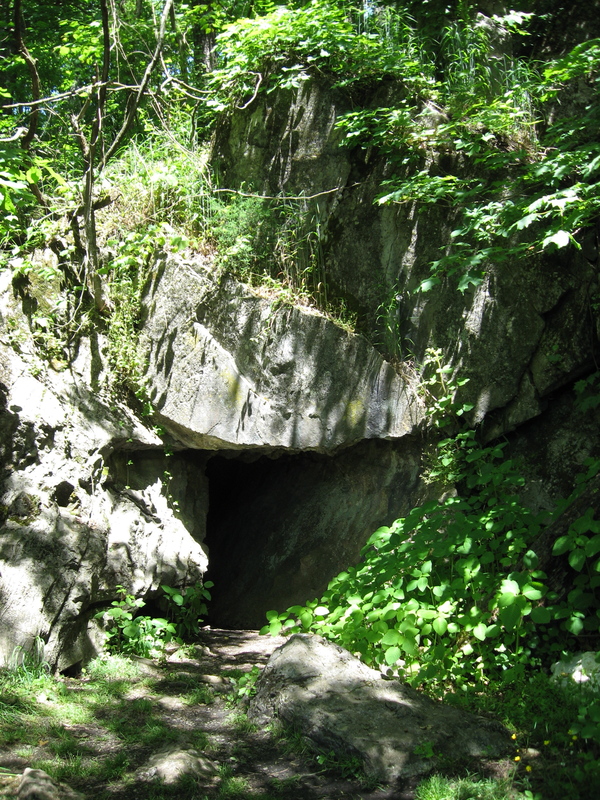 A spring and cave on the property attracted animals for thousands of years, and the animals attracted humans who hunted them with stone weapons. In the late 1600’s, the first Englishmen to set foot in Tennessee passed through the area; a century later, Daniel Boone stopped there. 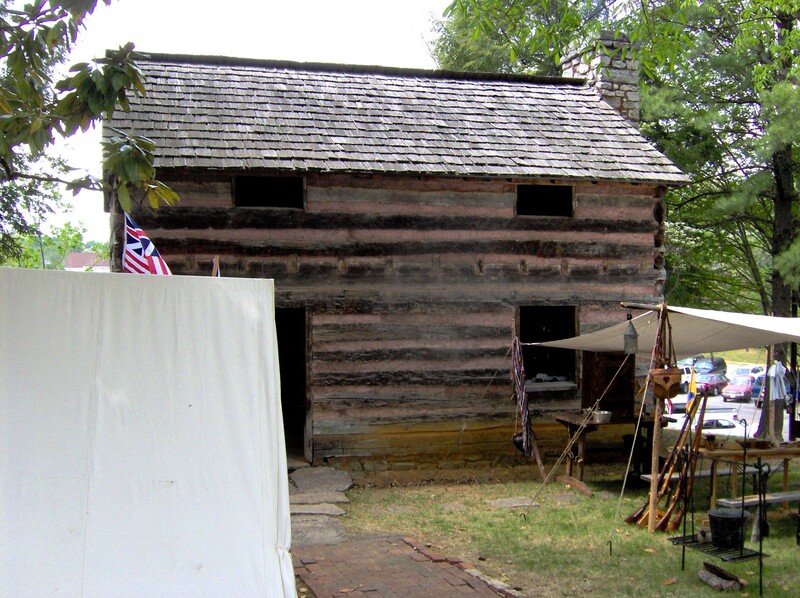 In 1784, when Tennessee was still part of North Carolina, Col. John Tipton purchased 100 acres around the spring and cave, building a one-and-a-half-story log home. That same year, some of his fellow settlers proclaimed the creation of a new State of Franklin, consisting of the three westernmost counties of North Carolina, with military hero John Sevier its first governor. The problem was that, as far as North Carolina was concerned, this statehood movement was illegitimate, and the Franklinites were still subject to North Carolina law. As you might imagine, the coexistence of two rival states in the same place presented a rather interesting political dilemma. Tipton refused to recognize the legitimacy of Franklin, and by late 1786 had become the region’s foremost supporter of North Carolina sovereignty. In February 1788, when North Carolina authorities seized some of Sevier’s slaves and took them to Tipton’s farm for safekeeping, the would-be governor and about 135 fellow Franklinites showed up to demand their return. Tipton and the other North Carolina loyalists holed up in the log house, trading occasional shots with Sevier’s force outside. When reinforcements arrived for Tipton, the standoff turned into an outright skirmish—the only armed confrontation between Franklinites and North Carolina—which ended in a retreat by Sevier and his supporters. The fledgling statehood movement petered out not long after the firefight at Tipton’s farm. The house and the land around it passed to Tipton’s son in 1813. In 1837 a newlywed lawyer named Landon Carter Haynes received the farm as a wedding gift from his father. Haynes built a number of additions to the house and constructed a small law office adjacent to it, where he attracted clients from across Tennessee and North Carolina. An ardent Southern advocate, he served as a Confederate senator during the Civil War. He obtained a pardon when the war ended, but left his home and moved to Memphis. The state purchased the property in the 1940’s. This complicated history of prehistoric hunters, stillborn states, and Civil War politicians is told in a fine new exhibit at the Tipton-Haynes visitor center, which includes artifacts excavated from the grounds, Tipton and Haynes family heirlooms, and short video presentations on the State of Franklin and slavery in the Haynes household. It’s a very attractive site; in fact, it’s difficult to believe that this pastoral little chunk of real estate exists in the middle of modern-day Johnson City. Unfortunately for frontier aficionados such as yours truly, Tipton’s log house was altered dramatically over the course of the nineteenth century. Its present appearance thus reflects the Haynes era more than the period of the Franklin battle, but it’s still a nicely restored structure. There are a number of outbuildings on the grounds, some of which are original to the Haynes farm, others reconstructed or relocated from other sites. A short path along an old buffalo trail takes you to the spring and cave. This is a great little site with an effective interpretation of an impressive cross-section of Tennessee history, and of course it’s located right in the cradle of the Volunteer State, so there are a lot of other historic places just a short drive away if you decide to make a day of it. Give yourself about thirty or forty minutes to take in the visitor center’s exhibit and an hour or so to tour the grounds. If you want to see a stellar example of what happens when a community embraces historic preservation, you should visit Jonesborough, TN. It’s the oldest town in the state (founded in 1779, when eastern Tennessee was still part of North Carolina) and a history lover’s paradise. My cousin and I paid a visit the other day, after our tour of Carter’s Mansion in nearby Elizabethton. The first thing you’ll want to do is stop by the visitor center to pick up a walking guide. These brochures are only $1.00, and they point out all the important historic structures and locations, most of them within easy walking distance. 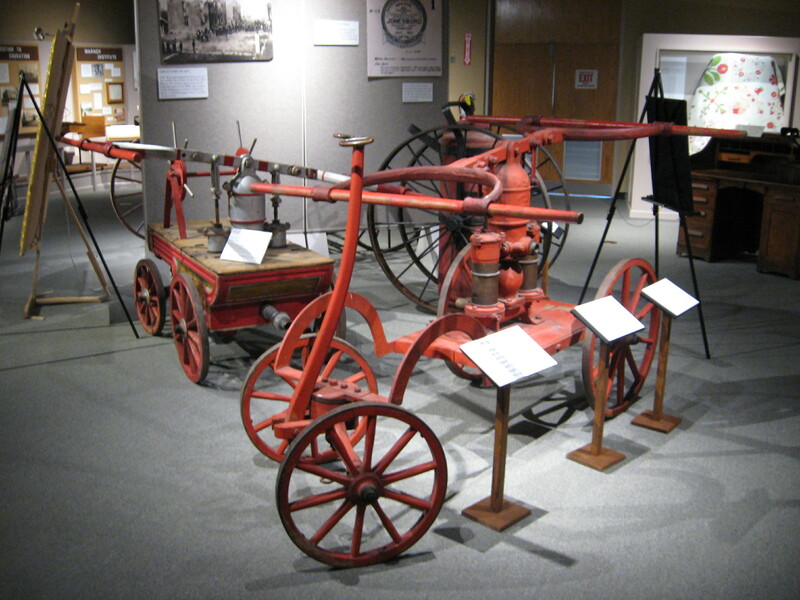 The visitor center also has a nice little exhibit on various aspects of Jonesborough’s past, including some nifty antique fire pumps. Jonesborough has, at various times, been the seat of Washington Co., created by North Carolina out of some of the western districts across the mountains; a capital of the abortive State of Franklin, which ceased to exist in 1788; a government and economic center for the Southwest Territory, when North Carolina ceded her western lands to the federal government; and finally, a county seat for Tennessee. 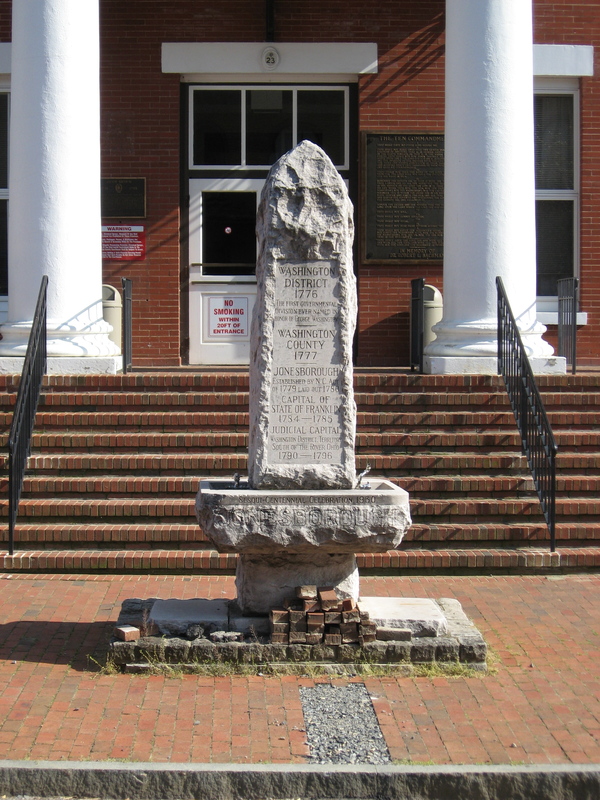 A monument in front of the current courthouse building marks the approximate spot where a log courthouse sat over two centuries ago. 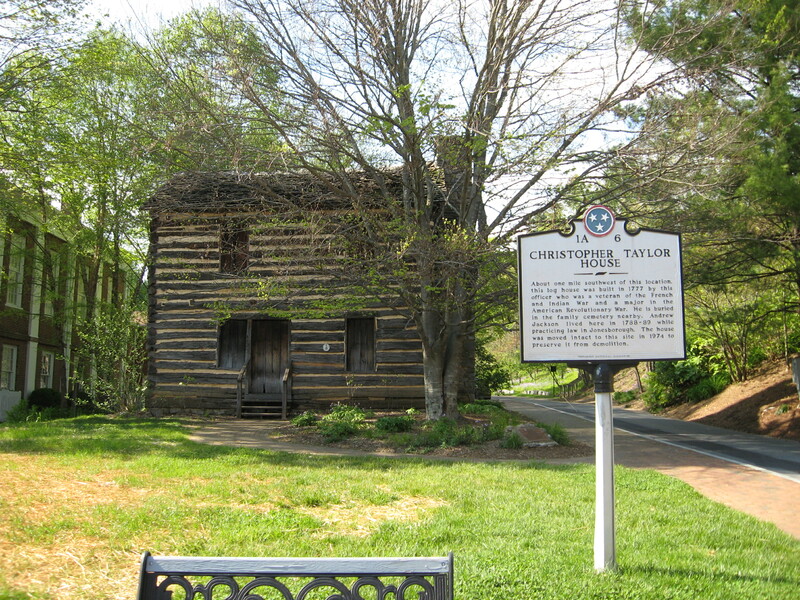 One of the oldest structures you’ll see in Jonesborough (one of the oldest structures you’ll see in the whole state, actually) is the log home of Christopher Taylor, built in 1788. A young backwoods lawyer named Andrew Jackson lived there for a short time before moving on to Nashville and national fame. 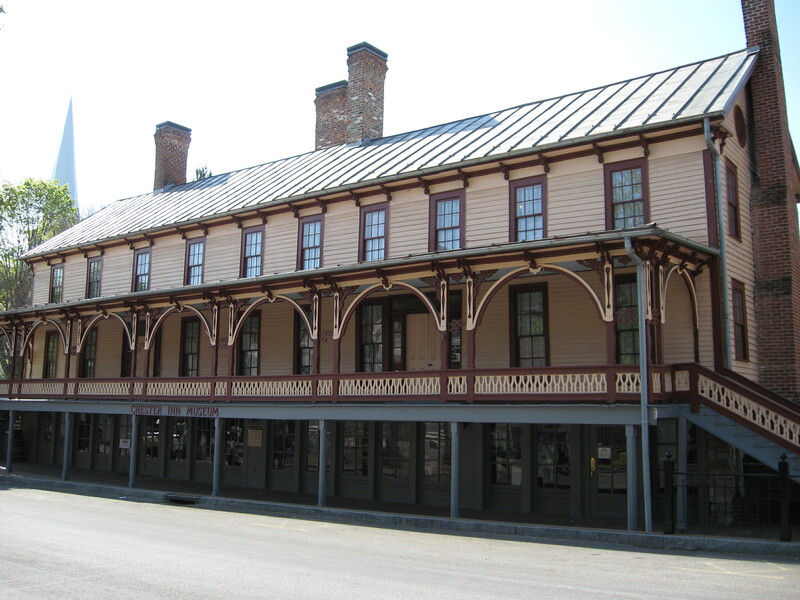 Later, after his election to the presidency, Jackson was a guest at the Chester Inn. Built in the late 1790’s, this building has also hosted Presidents Polk and Johnson, along with various other historic luminaries. Now it’s the home of the National Storytelling Festival. Check out the exhibit on the first floor; it offers a fine overview of the town’s history, and includes some pretty neat artifacts. Next to the Taylor cabin is the site where Elihu Embree published two anti-slavery newspapers, The Manumission Intelligencer and The Emancipator. The latter was the first newspaper in the country devoted solely to promoting the eventual eradication of slavery. 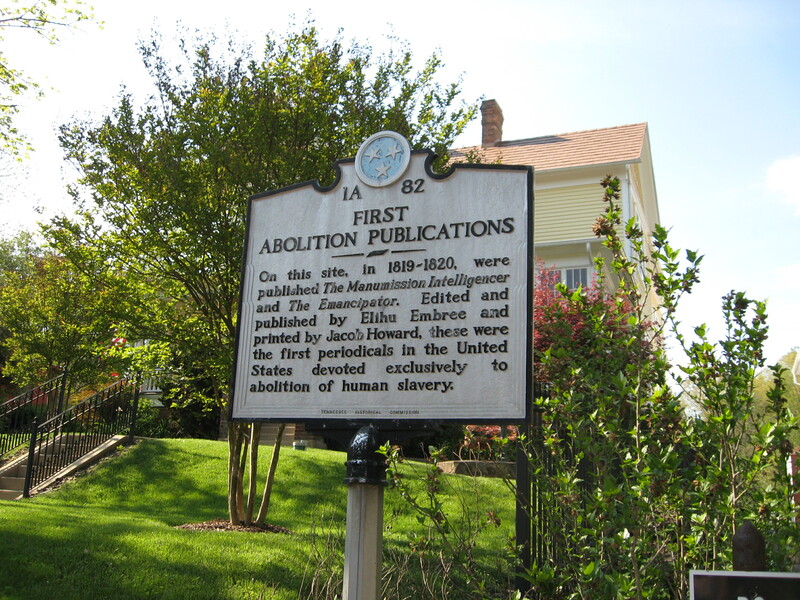 The son of Pennsylvania Quakers, Embree was actually a slaveowner himself until age thirty, joining a Tennessee manumission organization in 1815. The Emancipator circulated as far as Boston, but its run ended when Embree died at a young age in 1820. Our last stop was the town’s old cemetery, which sits on a hill near the historic district. Noticing a couple of small Confederate flags on one monument, I walked over to have a closer look. 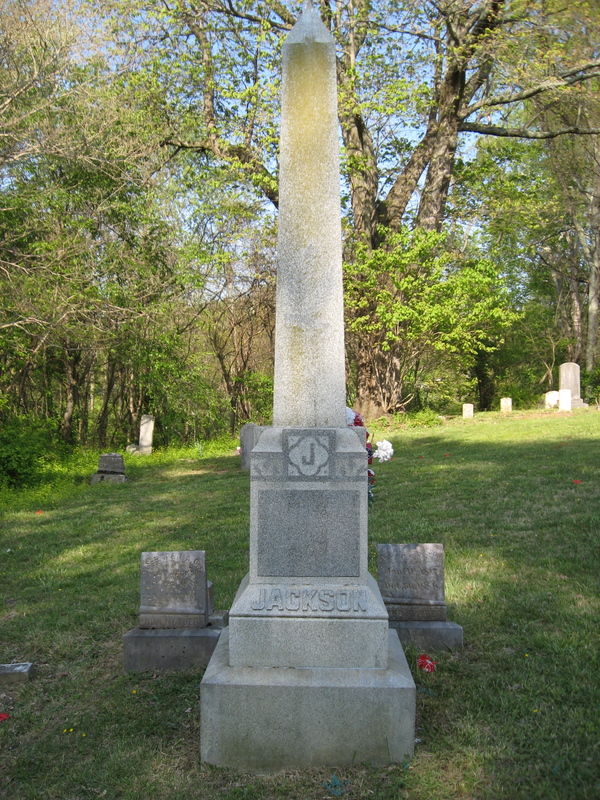 Turned out to be the grave of Brigadier General Alfred E. Jackson, who served as a quartermaster and paymaster before spending much of the rest of the war engaged in the small-scale actions that often flared up in the mountains of Appalachia. Jackson was quite unpopular among other Confederate officers; subordinates in Thomas’ Legion (which constituted part of his brigade) considered him “morally and physically unfit” for command and asked Jefferson Davis to give him the boot. The end of the war found this formerly prosperous businessman farming rented land in southwestern Virginia. He was eventually able to recover some of his antebellum prosperity and died in Jonesborough in 1889. 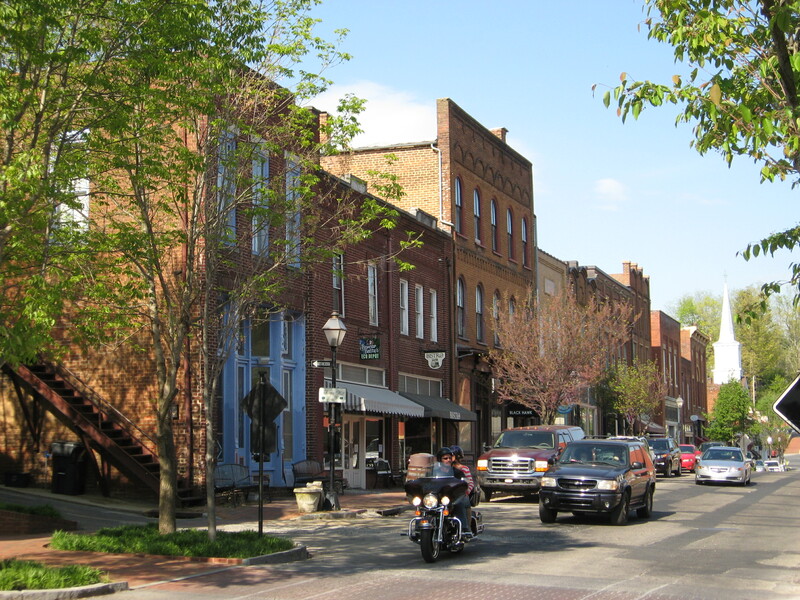 There are plenty of other stories and buildings to check out in Jonesborough, along with quite a few historic inns and small restaurants. The town is just a short drive from some of Tennessee’s best parks and historic sites—Sycamore Shoals, Rocky Mount, Andrew Johnson’s home, and Tipton-Haynes Historic Site, to name a few—so if you’re looking for a place to spend a history-soaked weekend, it’s hard to beat.